In theory, managing safety performance should be easy. No leader ever wants to see any harm come to anyone working for them. Nobody working for a living wants to go home hurt—or hurting—at the end of the day. When it comes to safety—where the ultimate goal is to send everyone home alive and well—there’s perfect goal alignment between what the leaders and employees want. This fact should make safety performance and enforcement easy. An industry CEO once affirmed that safety protocols should be, “Like breathing. Something nobody should even have to think about doing.” Indeed, this is a great theory. In practice, if safety were as easy as breathing, every outfit in the world would be injury-free and their employers and managers wouldn’t have to spend any time managing safety performance. 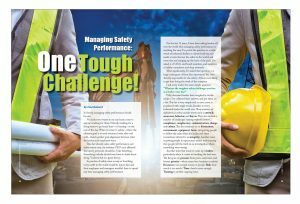 For the last 15 years, I have been asking leaders all over the world why managing safety performance is anything but easy. I’ve posed the question to a wide swath of industrial leaders at clients both big and small, at sites that are the safest in the world, and some that are bringing up the back of the pack. I’ve asked it of CEOs and board members, and members of safety committees and shop stewards. Most significantly, I’ve asked that question to a huge contingent of front line supervisors: the ones directly responsible for the safety of those most likely to get hurt doing the work of the company. Fifty thousand leaders have weighed in on the subject. I’ve collected their answers and put them on a list. This list is very simple and in most cases, is populated with single words, familiar to every industrial leader the world over. Their answers, in alphabetical order, include words such as attitude, awareness, behavior, and buy-in. They also include a number of challenges starting with the letter C: compliance, complacency, communication, change, and culture. The list continues on to distractions, environment, equipment, focus, and getting people to follow the rules when the leader isn’t there (sometimes referred to as integrity). Another issue is getting people to report near-misses and ensuring that people tell the truth in an investigation where something went wrong. Another term that tends to come up is habits—particularly when it comes to breaking the bad ones. The list goes on: pressure from peers, customers, and bosses; priority—what comes first, business or safety? Resources: not enough money or people. Risk: how much is too much? Time: there’s never enough. Training is another ongoing issue. With all these challenges, many wonder how they can actually achieve zero safety incidents. For those involved in the construction industry, these terms will sound familiar. Everyone involved in this industry knows about this list of challenges, as they are a constant reality for each working day. While leaders may prioritize them differently, or face them at different times, these types of issues remain a constant. There is also the issue of new staff needing training, and long-time staff possibly developing bad habits and getting complacent. Put simply, this is the list of what’s standing in the way of sending everyone home alive and well at the end of the day. If left unaddressed, these challenges will lead to people getting hurt. The challenge facing leaders the world over isn’t knowing about the challenges, it’s figuring out what to do about those challenges while still having the time to run the business. As to why leaders the world over face the same fundamental set of safety leadership challenges, there’s a simple explanation: every one of the challenges comes about because of people. As people go, we humans have a huge set of strengths. We’re curious. We see possibilities. We innovate. We love challenges and solving problems. If it were otherwise, we’d still be living in the Stone Age. On the other hand, we find doing mundane and repetitive things boring. When we get bored, our minds wander. We’re easy to distract. We don’t like someone telling us what to do, because we’re sure we know better. We aren’t inclined to follow rules or bother to read instructions first. If there’s a shortcut to be found, leave it to us to find it—another thing we’re very good at—and then we immediately spread the word, which, social creatures that we are, we love to do. When it comes to safety, the problem becomes obvious: being safe demands that we do many of the things we don’t like to do and refrain from doing the very things we are naturally inclined to do. Putting people in an environment with hazards—and every workplace has plenty—and challenging them to “get it done” can often lead to certain safety issues. Is this challenge really one of resistance to change? Resistance—people pushing back—simply means making change happen requires more effort and energy. Change becomes a heavier lift for the leader. That is a problem, but a simple problem. Suppose, because of resistance, people don’t make the change they’re expected to? They’re still doing it the old, less-safe way. In that case the real problem isn’t resistance, it’s execution. When it comes to safety, the failure to change represents a much bigger and more serious problem. Even in the case of the seemingly simple and straightforward problem of resistance (“I don’t like this change”) there’s more than first meets the eye. When employees raise objections to a change because it creates new problems with how they do their jobs, is that resistance? Despite what many leaders perceive, raising legitimate problems about the practical implications of any change is not resistance. Resistance is one thing: “We don’t like this change.” Raising real problems is an entirely different thing and can be useful. Sooner or later, those problems are going to crop up. It is better to acknowledge these issues sooner, so a good leader will be grateful when potential issues are brought to their attention. Additionally, it is important to recognize the difference between the problem of resistance to change and the challenge of executing change. It’s no small difference. Complacency is often similarly misdiagnosed. A manager might think that his employees aren’t thinking or that they’re on autopilot and label them as complacent. The brain, however, does not have an on-off switch. It’s processing information constantly, whether awake or asleep. It’s a virtual certainty that the person being described as complacent is actually thinking about something, just not what they’re doing at the moment they’re doing it. Thus, the true problem is that the brain is not on task. When it comes to safety, that is a huge problem that gets all kinds of people hurt. As to why someone would not be paying attention to what they’re doing, boredom or distraction is generally a good explanation. When a worker has done something a hundred times and not gotten hurt, it’s easy to think attention and focus are not needed. Therefore, the real problem is about the perception of risk. An employee may think that nothing bad will happen to them, and thus move on to thinking about something else that is more interesting to them and not what they’re doing at the time. Even leaders can suffer the symptoms of complacency. When a leader believes they have safety under control, they may believe that they can move onto other things. However, since safety is never straightforward, this can be a critical error. Even a challenge as simple as training isn’t that straightforward. New people don’t just need training—they need effective training, which costs money. Additionally, not everything the new hires need to learn can be taught in a training class, which costs additional time—sometimes from leaders. Engaging with the issues of change, complacency, and training can give you a better understanding of how difficult these challenges are—and help you come up with potential solutions. Every day, leaders all over the world take on this familiar, but formidable, array of totally familiar challenges. Their success can be measured, simply, in the safety of their workers. Despite all the challenges, on most days every single crew member working for the vast majority of supervisors goes home uninjured. Statistically, injuries—at least the more serious injuries—are relatively rare. As to how rare, the answer is found in the injury frequency rate. As metrics go, the injury frequency rate takes a lot of criticism. It’s not forward looking, it doesn’t measure severity, and it doesn’t measure near-misses or process problems that don’t produce injuries. These criticisms are all true. However, the injury frequency rate has one great thing going for it: everybody uses it. Thus, the rate can to be used to compare performance between companies, sites, departments, and even individual leaders. Industry groups do that on a regular basis; whenever they do, the distribution curve reveals the value added by leaders through their process of safety leadership. As to how, that’s simple. Every company starts with the same set of tough safety challenges. All are in business, and within any industry group (mining, metal fabrication, construction, maintenance, chemical manufacturing, etc.) they’re in the same business. That means they have the same hazards and employ the same processes. Everyone starts out with the same inputs; in terms of output (result), however, that’s not at all where they end up. In the United States, according to government safety statistics, Company B is average. When it comes to sending people home safe, they are right in the middle of the distribution curve: half of their competitors—not just in their industry, but in all industries—do a better job, while half don’t. This judgement is based on simple math—but this math makes a vitally important point: in the process of managing safety performance, some leaders do a far better job than the rest of their peers. It’s not companies who compete, but their leaders. Consider the good leaders at Company A: collectively, they are getting 15 times better results than their peers at an average company. Of course, as they’re great leaders, they’ll probably give the credit to their followers for the results. The math reveals the real story. Leaders the world over know intuitively exactly what their toughest challenges are. Give any busy leader the time to pause and reflect on those challenges, it won’t take long for them to understand the nature of the challenge: the combination of people, hazards, and the goal of production. It really is that simple. Understanding the challenges is one thing. Doing the right things as a leader to actually ensure good people are working safely is what matters. What should they do to make a difference? That’s the question leaders all over the world are searching for an answer to. but acknowledging the value of change and then changing is critical. Ultimately, managing safety performance is the leader’s work, and sending everyone home safely at the end of the day is the most important work every leader has to do. This article was published in the February 2017 issue of Insulation Outlook magazine. Copyright © 2017 National Insulation Association. All rights reserved. The contents of this website and Insulation Outlook magazine may not be reproduced in any means, in whole or in part, without the prior written permission of the publisher and NIA. Any unauthorized duplication is strictly prohibited and would violate NIA’s copyright and may violate other copyright agreements that NIA has with authors and partners. Contact publisher@insulation.org to reprint or reproduce this content.